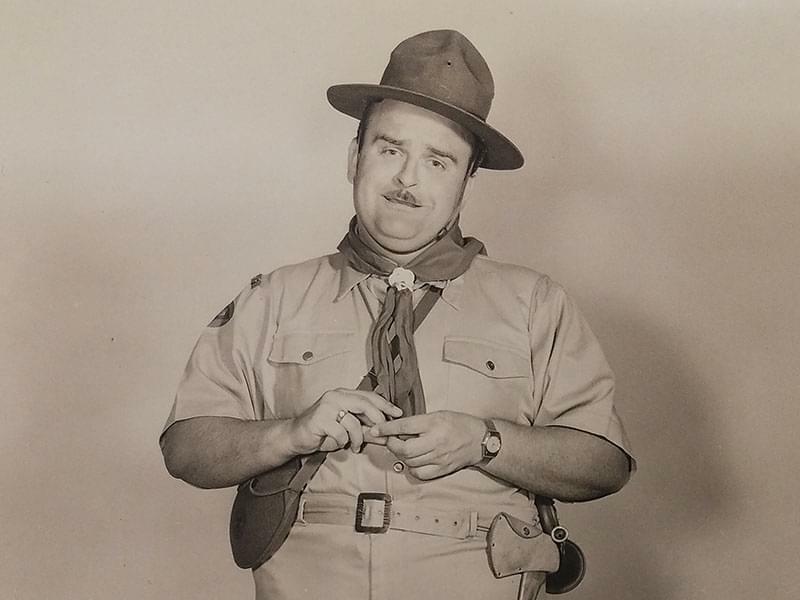 Farmer City native George Rock, costumed as a Boy Scout to promote his little-boy's-vocal rendition of "My Daddy Is A General To Me" for Spike Jones And His City Slickers, circa 1951. You’re going to hear a lot of Christmas songs between now and December 25th. And you may hear one that features a little boy asking Santa to replace his two central incisors, after losing them in a slide down the bannister. The vocalist that made that song famous was George Rock, a trumpeter hailing from the central Illinois town of Farmer City. “All I Want For Christmas Is My Two Front Teeth” has become a mainstay among Christmas novelty songs, recorded by everyone from Nat “King” Cole to Alvin and the Chipmunks. But it was George Rock’s version, recorded with Spike Jones and his City Slickers, that first made the song famous. The recording, released by RCA Victor, was an enormous hit, with sales in the millions during the Christmas season of 1948 and again in 1949. George Rock did not use his normal voice for the song. But, a little-boy falsetto was a vocal effect that Rock used throughout his career, including several times during his 16-year stint as lead trumpeter for novelty bandleader Spike Jones. Jordan R. Young, who interviewed Rock for his 1984 biography of Jones, says he never said anything about the little boy’s voice or how he developed it, but that didn’t surprise him because “he was so modest". Rock had recorded an earlier record with the child’s voice for Jones, released in 1947 as a B-side entitled “(I’m Forever) Blowing Bubble Gum”. But Young says it was Don Gardner’s song, “My Two Front Teeth” (which Gardner, a schoolteacher, had originally composed for a children’s Christmas pageant) that turned George Rock into a minor celebrity. Spike Jones had chosen the song in a hurry --- he was stockpiling recordings in 1947, in anticipation of an American Federation of Musicians ban on recording, which would end up taking nearly all of 1948. Jones' banjo player Freddie Morgan and staff writer Eddie Brandt added a bridge and additional lyrics to punch the composition up. The result would be a song that George Rock would sing for the rest of his career. The DeWitt County town of Farmer City can boast of a congressman (Vespasian Warner) and an Illinois Supreme Court justice (Lott R. Herrick) among its native sons. But while those names have largely faded into obscurity, George Rock is remembered every December, when “My Two Front Teeth” gets its annual airing. 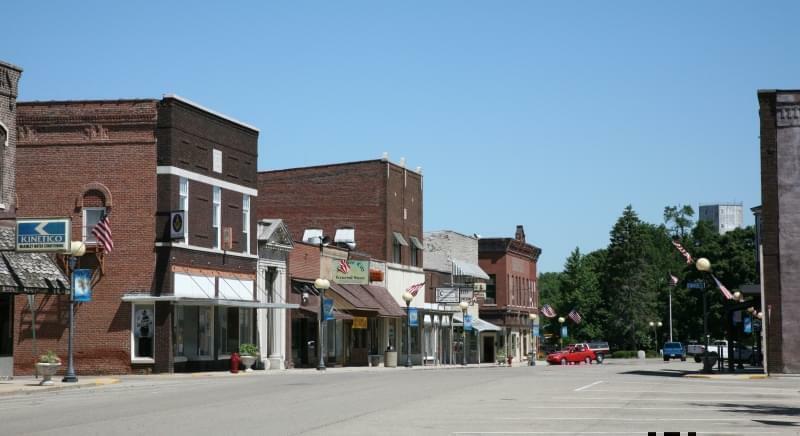 Rock was born in Farmer City in 1919 to a musically inclined family. He grew up in the town, which at that time was a busy commercial hub for surrounding farming communities. Rock began playing the trumpet in high school --- a yearbook for Moore Township High School shows Rock as a member of the high school band and orchestra. A yearbook article on the school’s musical groups even carries Rock’s byline. Dean Scarbrough, whose family owns controlling interest in Maple Grove Cemetery just outside Farmer City, is now in his 90s, and remembers Rock as a boy. “He was just a kid”, said Scarbrough. “Everywhere he went, he carried that trumpet. People raised hell because he played that trumpet all the time. Rock attended Illinois Wesleyan University in Bloomington for a year on a football scholarship. But music would turn out to be his true vocation. At age 20, Rock sat in with a band that came to town to perform at the Farmer City Fair. They ended up hiring him, giving Rock his first professional gig. Five years later, Rock began playing with Spike Jones and his City Slickers, after Jones saw him performing with Freddie Fisher’s band, which played Dixieland jazz and novelty numbers not unlike the City Slickers’ repertoire. The Slickers were known for their chaotic sounding but actually carefully planned novelty tunes, staged with outrageous sight gags and costumes. Rock, a big man sporting a mustache, would often dress in a Buster Brown suit or other children’s garb for his little-kid vocal numbers. Rock would perform and record several numbers for Spike Jones over the years, using his little-kid voice. He also could be counted on for various vocal effects --- from belches to a maniacal laugh --- that were sprinkled through the City Slickers’ music. But all that was just a sideline to Rock’s talent for playing the trumpet. As the band’s lead trumpeter, Rock was usually the one stating the melody, no matter what else was going on in a musical arrangement. He could also use the trumpet for a variety of effects. One piece where Rock could show off his versatility was a setting of the old Ukrainian melody, “Minka”, which became one of his showcases. In a performance preserved on Spike Jones’ 1950’s television show, Rock plays the melody with swing inflections, then takes a chorus with a variety of growling effects, plays another swing chorus with a mute and finishes with a lightning-fast solo in which the melody’s sixteenth notes are divided into a succession of 64th notes. Rock would be a mainstay of Spike Jones and his City Slickers, both on tour and on records, and also on a network radio show in the 1940's and TV shows in the '50's. He also performed with Jones' "straight" band, known as the Other Orchestra, which Jones created in a bid for musical respectability, although it never achieved the mass popularity of the City Slickers. “He was a musical inspiration to the band,” remembers drummer Joe Siracusa, the last surviving member of Spike Jones’ band during its peak years in the late 1940’s and early 1950’s. To his daughter Georgy, George Rock was a delightful, loving father that she didn’t get to see enough of, due to his frequent touring. She only gradually realized the high regard he had earned from his fellow musicians. Business for the City Slickers gradually petered out as the 1950’s ended. George Rock left the band in 1960, and started his own sextet, which leaned toward Dixieland jazz. But he still made use of his distinctive child’s voice. “I Should Have Left The Light On”, released as a single by the George Rock Sextet, features Rock again impersonating a child who hears Santa (but more likely his father) fumbling in the dark to place presents under the tree on Christmas Eve. Rock also played occasionally with bands organized by drummer Joe Siracusa to play in the Spike Jones tradition. Rock was featured on an album by one of these groups, performing as the New Society Band. And he took part in a Salvation Army benefit concert by another version of Siracusa’s group, performing as the Phunharmonic Orchestra, which was emceed by a deejay who specialized in novelty music under the name of Dr. Demento. Dr. Demento, who still spins novelty tunes for an online program at his website, www.drdemento.com, was a celebrity in his own right in 1985, when he emceed Siracusa's concert at which George Rock performed. (A video of Rock with the Phunharmonic Orchestra appears on YouTube). He remembers being so wrapped up in listening to Rock’s performance, that he curtly told an autograph-seeker not to interrupt him. Georgy Rock says her father had always spoken fondly of his home town. And in 1987, George Rock returned to Farmer City, as the grand marshal for the town’s sesquicentennial parade. A short time later, Rock traveled to Farmer City again, this time, his daughter said, to stay. Divorced, in poor health and low on funds, all reports indicate that George Rock was happy to be back in his home town. He struck up a relationship with Virginia Russell, the widowed editor of the Farmer City Journal. But in April of 1988, just months after his return to Farmer City, George Rock died, at age 68, due to complications from diabetes. In their obituary for Rock, the Farmer City Journal reported that he was happy to renew friendships from his youth, and “he enjoyed strolling across the street to watch the high school marching band practice. The school had been remamed three times since he had belonged to its band, but it was his alma mater and he cherished memories of those years”. Rock’s remains were cremated, but the burial of his remains were delayed for years, at least partly due to a rift in the family, according to Georgy Rock. George Rock’s remains were finally laid to rest in 1995, in Maple Grove Cemetery next to his parents, and money was raised for a shared gravestone. The back of the gravestone for George D. Rock and his parents, Roy and Theresa makes note of Rock’s musical career with Spike Jones and his City Slickers, and his hit record, “All I Want For Christmas Is My Two Front Teeth”. Rock and his parents are buried at Maple Grove Cemetery outside of Farmer City. George Rock is also remembered by a street named after him. George Rock Drive is the main road in a small subdivision on the southwest edge of Farmer City. And the Farmer City Genealogical and Historical Society includes several items related to Rock at its storefront museum, from a “Gold Standard Series” pressing of “My Two Front Teeth” to a glittery vest, brightly colored in a red, blue and gold rose pattern, that Rock wore for performances. Thirty years after his death and 70 years after the City Slickers’ heyday, Susan Ryan, who edits the Historical Society’s newsletter, says she’s not sure how many Farmer City residents know who George Rock was. But she hopes that some still remember him. “I think a lot of people, they recognize he (Rock) was someone that was really accomplished from Farmer City”, said Ryan.